UFO SIGHTINGS DAILY: NASA Posts Fake Mars Photo As Real, Worst Fake Photo Ever! Aug 2015, UFO Sighting News. 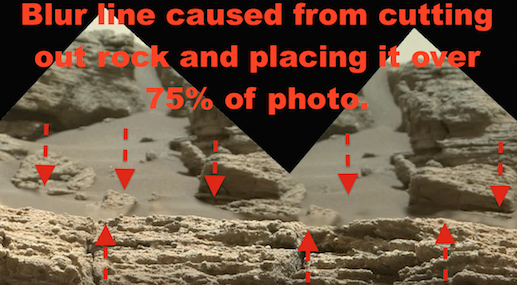 NASA Posts Fake Mars Photo As Real, Worst Fake Photo Ever! Aug 2015, UFO Sighting News. 1. 75% of the photo is covered by a large rock outcropping However this photo is an object. A photo object, is one that has been cut out and pasted over an area. Another amateur mistake they made is the rock was to small of a photo, and they cut it out when it was small, then enlarged it by 5X or more to place it over the area. This caused a thick blur line to be seen between the big rock that cuts across the entire photo. 2. The rocks at the top of the photo have been repeatedly used. What I mean is the small bunch of rocks on the upper right has been copied and pasted into two different locations. 3. The rocks on the upper left (photo object) were copied and pasted into three different locations in the photo. Being a teacher, I have seen elementary children use photoshop more effectively than I see NASA doing here. I have read a lot of comments over the years from people who believe the Mars rover isn't even on Mars at all. That NASA faked it all to spend the money on other black budget things. This photo, confirms and backs up their allegations. This...worries me...that they could be right. The picture displayed on the NASA site blatantly shows changes made with Photoshop, the reason is not clear but it is evident how the photo was manipulated.